Amid its ongoing chicken crisis, which has closed many of its UK restaurants, KFC took out a full-page ad in two tabloid papers featuring a KFC bucket adorned with the letters “FCK”. The ad, created by Mother London, is running in the Sun and Metro newspapers. Copy below the bucket begins: “A chicken restaurant without any chicken. It’s not ideal,” and goes on to apologise to customers. 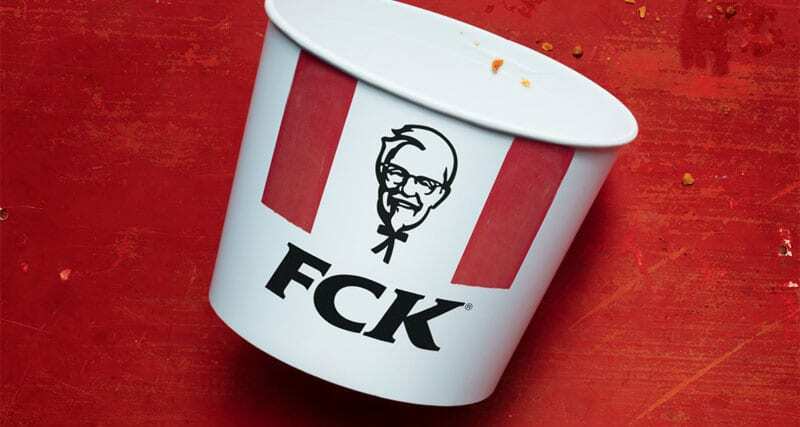 The ad grabs readers’ attention with a reimagining of the chain’s logo undoubtedly echoing the sentiments of both fast food fans and company executives to the chicken shortage: reordering “KFC” to read “FCK”. The work has set social media abuzz: one fan called it “possibly the best apology ad ever” while users from the ad and PR industries praised it as an example of great crisis management; James Herring, founder of PR firm Taylor Herring, tweeted that it was “perfectly pitched”. A nearly week-long delivery crisis that has resulted in the closure of about two-thirds of KFC’s 900 stores in the UK followed a change in its distributor from South African company, Bidvest Logistics, to DHL. KFC’s UK operations are reeling from a decision to award a contract to DHL in November, ending a 20-year relationship with Bidvest Logistics as its distributor. KFC, explaining the decision to switch distributors, said there “had been little variation in food-service logistics” and it had specifically chosen DHL and QSL for their reputation for “innovation in logistics across other industries”. Bidvest Logistics is part of Bidcorp, the international food services and distribution company that was unbundled from Bidvest in 2016. A Bidvest spokesperson said the relationship with KFC’s UK operations ended when “the contract was put out on tender and was awarded to another company with effect from February 14 2018”. Bidvest Logistics also delivers to Pizza Hut, Burger King, Nando’s, Pizza Express, Pret a Manger and TGI Fridays in the UK. Unions in the UK have been the most vocal about the impact of KFC’s decision, which has resulted in job losses of about 255 people at Bidvest Logistics, and said the only recourse was for KFC UK to take back the company as the main distributor. Mick Rix, GMB trade union national officer, said unions had warned KFC last month over its decision to switch distributors and that the move would have consequences. “The chickens are coming home to roost. Bidvest are specialists – a food distribution firm with years of experience. “DHL are scratching around for any work they can get and undercut them. KFC are left with hundreds of restaurants closed, while DHL try and run the whole operation out of one distribution centre – where conditions are an utter shambles,” said Rix. The decision to change distributors, analysts said, was damaging not only to KFC’s bottom line, but also to its brand. KFC’s UK unit has sales of about £500-million (R8.1-billion) a year and the closure of stores could cost it £1-million per day in lost revenue. Also at risk is the brand of DHL and its partner distributor, QSL Logistics. DHL said in a statement that the chicken shortages which had hit KFC’s stores were “teething problems” and would soon be resolved. At the time of being awarded the contract, DHL said it intended to “rewrite the rule book” and its model would support KFC in its ambition to be “market-leading” in all that it does, while “improving service levels to its restaurants and customers”. Frank Proud, a logistics expert and director of Apex Insight based in London, told Business Times that KFC had made the switch from Bidvest to reduce costs. “A key factor in this is that while Bidvest served the KFC chain via six sites around the country, DHL is using just one main warehouse. “The UK is a small country in area, so that is not a crazy thing to do, but it might mean that there is less spare capacity in the system if things do go wrong,” he said. The challenges faced by KFC’s UK operations, should they persist, are expected to benefit rivals such as Nando’s, McDonald’s and Burger King.